For St. Patrick's day, we made a bouquet of shamrocks/clovers. This is an easy to make project. The tutorial can be used to create spring flowers too! Green felt/Green Construction Paper (I used 9" X 12" felt sheet). Using the cookie cutter as reference, Cut the felt sheet into a square/rectangle shape. With my cookie cutter size, I was able to make four clovers from the 9" X 12" sheet. Unfold the square/rectangle felt. Shamrock shape ready! 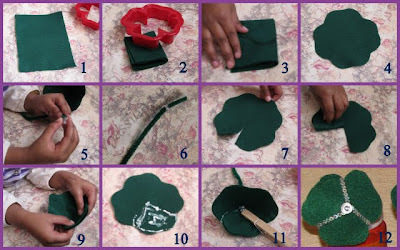 To create the clover stem, run the pipe cleaner through the button hole starting at the bottom of the button and back down through the other hole. 3d Shamrock/clover with the stem! Those are so cute! Thanks for sharing your instructions! And.. thanks for linking this up with For the Kids Fridays at Sun Scholars. I can't wait to see what you have to share this week! I'll be posting the next party later tonight. Hope to have you stop by!